If you would like to shatter all the usual stereotypical images of Spain, then this deluxe food, wine and cultural tour of Galicia is just for you! Galicia is in the north-western corner of Spain right above Portugal, it is a fresh and verdant land that has gushing rivers and a coastline more reminiscent of Scotland than Spain. The weather is cooler than other parts of Spain and often misty with an age-old magical atmosphere, which travelers can share in historic sites like; Cathedrals, Castles and Celtic Hill-forts. Galicia is the most forgotten of the seven Celtic nations, the others six being; Brittany, Scotland, Ireland, Wales, Isle of Man and Cornwall. Even so, it has some of the oldest Celtic traditions, going back more that 2000 years. You may even hear Galician bagpipes (Gaitas) droning across the pasture while touring this unique Celtic Land. On this tour you will discover Galicia with all senses... starting off in Santiago de Compostela the Capital of the region and also the end of the important Pilgrimage Way of St. James. Here you will walk the streets of the old quarter and visit the Cathedral which marks the heart of this historic centre. Then you will follow down the Atlantic coast in the area called the Rias Baixas (Low Estuaries or Bays), here you will get a chance to stroll along the ports of small fishing villages and enjoy exclusive visits to various wineries making the highly acclaimed Albarino white wines of the D.O. Rias Baixas. In between winery & cultural sites you will stop to dine in a mix of different types of restaurants while touring, we have selected them to show you the variety of the Galician Cuisine... from Michelin Star Restaurants like Toni Vicente in Santiago to small fishermens taverns right on the docks offering an abundance of fresh seafood (Spider Crab, Bay Prawns, Lobster, etc...) caught just that morning and served in handmade wicker baskets right on the table for everyone to dig in and enjoy this delectable finger-food. While on the coast you will get the chance to learn in-depth about the gastronomy by cooking side-by-side with a Galician woman who owns/runs a small Rural Country Manor & Restaurant and knows just about all the traditional coastal cooking secrets of Galicia! After following down the Rias Baixas coast your inland journey begins alongside the Mino River visiting a few more Albarino wineries, then entering into the next wine region D.O Ribeiro. Walk the streets of the old Jewish Quarter of Ribadavia the heart of Ribeiro wine country. 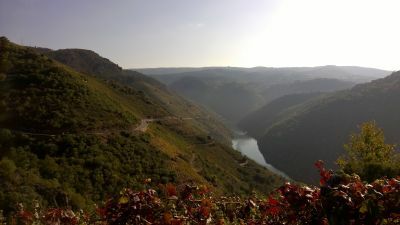 Finally the Mino River will take us to the Ribeira Sacra (Sacred Riverbanks) where it meets with the powerful River Sil. The name Ribeira Sacra comes from having a large concentration of Monasteries in the area, and thanks to these Monks over the years they have founded the tradition of the D.O. Ribeira Sacra wines made fundamental of the Menica red grape. A young wine that goes excellent with baby goat or lamb, which will be on the menu after visiting wineries of this region and taking a catamaran cruise down river to see the vines and beautiful landscape of this sacred land. Moving on across Galicia our next wine region is the D.O. Valdeorras where you will try Godello white wines as well as Mencia reds. Next we step over to El Bierzo right next door to Galicia in Castilla y Leon, but who have much in common from their ancient Celtic ties. As well in this region there is an important reminder of the Roman past with the largest gold mine of the Roman Empire in Las Medulas. In this region you will try yet another Mencia wine, but from the more arid lands of D.O. Bierzo, which have a distinct flavor to them. Bierzo marks the end of the winery visits, but we still have some cultural and gastronomical treats on the agenda before winding down. Making our way back to Santiago we will follow through some of the historic towns on the pilgrimage way of St. James like; Villafranca del Bierzo, then on to the mountain-top Celtic village of O Cebreiro and the Roman Walls of Lugo a UNESCO Monument. Our last night will be spent in the Historic Parador de Vilalba built within the old castle tower of Vilalba, nearby you will dine in a traditional restaurant saying goodbye to your final evening in this Celtic land with a magical Queimada (traditional spirit, flavoured with coffee beans, and then flamed)". For your comfort during the trip we have selected a mix of Paradores in Santiago, Baiona, Ribeira Sacra and Vilalba. These accommodations are placed within historic building like Monasteries, Castles, etc... Ranging from 4* to 5* GL (Grand luxury). Then as well you will have a few more rural stays in Galician Pazos, which are Noble Manor House with all the amenities of a Parador but on a smaller more personal scale. Come Discover the Magic of Galicia with a Gourmet Appetite! - Your private driver/guide will meet & greet you at the Airport or train station depending which way you arrive. - Then we will visit another selected winery of the region. - Dinner on your own tonight, your driver/guide can take you to Cambados´s old quarter where you could choose from one of them many restaurants for dinner. - Continuing on we followalong the coastline arriving at the point of the Peninsula of O Morrazo. - In the small village of BUEU we will have a seafood lunch in a local restaurant. - After lunch we will walk around what is know as Cabo Home (Man´s Cape) in DONON here we see a few lighthouses (including an Ancient Celtic Lighthouse at the top of Monte Facho) all with excellent view of the Cies Island in front. - In the small village of Hio we visit the Wayside Cross of Hio the most famous in Galicia and built from on solid block of granite. Beside the cross is the Romanesque Church of San Andres (St. Andrews) we take a peek inside before leaving. - Some free time in the morning to enjoy your surroundings, talk a walk around the village or whatever you please. - Today you will cook side-by-side with a Galician Chef who knows all the traditional coastal cooking secrets of Galicia! - You will be shown how to make a 3-course menu based in Fish and Seafood in the fully-equipped kitchen of a small cooking school. - Lunch will be based on what you have prepared accompanied by fine Albarino wines. - Then a tour of VIGO city and some free time for shopping. - Then off to the Castle of Monterreal which is now is a fabulous Parador where we will be staying tonight. - After we will make our way to the top of the St. Tecla hill with PANORAMIC VIEWS of the RIVER MIÑO meeting the Atlantic sea, and views of the mountains of Northern Portugal. - We will follow along the Mino river stopping to see the Castle of Salvaterra and where they also celebrate the wine festival of this sub-zone every year. - We will pass through small village like As Neves famous for its Goat Cheese and Honey. - Visit the wine cellar of the manor with the owner who makes excellent Albariño & Condado wines in the valley. - Views from the Manor are spectacular being surrounded by vines and the Mino River below. - Then we drive to Monforte in the Ribeira Sacra Valley (Sacred Riverbank). - Then in the afternoon we drive back to MONFORTE DE LEMOS, here we will visit the remains of the Tower and a monastery. - Dinner on your own, try one of the restaurant in the village. - Depending on your departure if time permits we could stop in Arzua to try and the opportunity to buy some of Galicia´s fine Tetilla Cheeses. - Those who are continuing on by other means of transportation will be dropped off in the Renfe Train Station in Santiago city. - (L): 6 Lunches: 2 or 3 course gourmet meals changing the cuisine & wines typical of each region visited. All restaurants are selected for location, service & fine quality. - (D): 8 Dinners 2 or 3 course gourmet meals changing the cuisine & wines typical of each region visited. Most of the dinners are in the hotels where you will be staying overnight. All restaurants are selected for location, service & fine quality.